Large wall erected around Rome between 271 and 275 C.E. to defend the city from attack by barbarians; begun by Aurelian but finished by Probus. 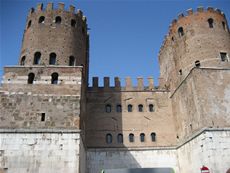 The Juthungine War in Italy in 270 had demonstrated the vulnerability of the city, so construction was begun on the wall with the cooperation of the Senate and the associations of workers and artisans in Rome. Because of the crises and internal threats of the time no Legions were available, so virtually the entire wall was built by civilians. The Aurelian Wall was not strong enough to withstand a protracted siege, as inconceivable as that must have been to the Romans, but was built to repulse a sudden barbarian onslaught. It was 12 miles long, 12 feet wide and 20 feet high, intertwined with other, older structures. It had 18 gates and 381 rectangular towers, interspersed to provide adequate observation. Changes were made by Emperor Maxentius (c. 306), who added to its height by installing galleries. A ditch was also initiated when the Magister Militum, Stilicho (c. 401–403) made repairs, followed by similar activities by Valentinian III (c. 442) and post-imperial rulers.